A motivated, happy workforce doesn’t just benefit your company with increased productivity and better quarterly revenues. Employee engagement also guarantees that you get to retain your best employees, enjoy a higher level of staff loyalty, stave off nascent union organizing and ensure your company remains innovative and competitive going forward. With that in mind, let’s examine the most common warning signs that suggest your employees aren’t as motivated or engaged as you’d like them to be. Everyone knows teams or individuals who are content to be “just good enough.” Yes, they’re hitting their targets, but box-ticking metrics aren’t the stuff of great companies. Try to develop a culture that inspires your employees to want to become excellent in everything they do. Most employees should be fine with taking constructive criticism; ideally, they should be actively seeking it out. Unfortunately, some resist feedback, and this can be a sign of increasing withdrawal, both in the workplace and elsewhere. Some employees can be overly protective of their own status quo. Not wanting to be blamed for failure, they shun any risk at all. Regardless of the specific benefits that your company enjoys from good interpersonal relationships among your staff, it is a universal truth that bad employee interactions are always a net detriment to productivity. Having employees who won’t work on maintaining or fixing good relationships is a sure sign of trouble further down the line. Changes to workplace practices can often trigger a natural and subconscious resistance in employees, which should be predicted and managed as such and even leveraged as a coaching or training opportunity. Regardless, it should only be a temporary reaction and dissolve over time. However, when employees demonstrate a chronic and obstinate desire to stay stuck in their ways, it may be an indicator of other, more serious, underlying issues. Not dissimilar to the desire to shun risk, a lack of interest in experimentation suggests that your employees have grown bored with their work and encounter a lack of stimulation and curiosity in what they do. Employees who excuse their own work by finding fault in someone else’s show a lack of accountability. They never learn from their mistakes. It shouldn’t be a hard sell to get your employees to expand their skill set and make themselves more valuable in the process. If some of your staff are reluctant to engage with workplace training and ignore offers of educational opportunities, you might want to explore it with them further in a bid to address any preexisting concerns. We know gossip when we hear it, and in the workplace, it’s never a good thing. Not only does it decrease team cohesiveness, damage morale and inculcate a negative atmosphere, it’s also a consistent precursor to the beginnings of union organizing in your firm. Rumors and hearsay can spread false notions and add fuel to the fire that union officials rely on. If you get that feeling that some of your employees are jealous of others, or that there’s a rift between a department or two borne out of a feeling of inequity, it’s definitely worth investigating. What might appear as a sense of petty injustice can have large ramifications on labor relations further down the line. And, finally, what could be more indicative of disengagement than your staff not turning up to work in the first place? Fortunately, this is usually one of the last signs to manifest itself, giving you plenty of opportunity to address the problem beforehand. 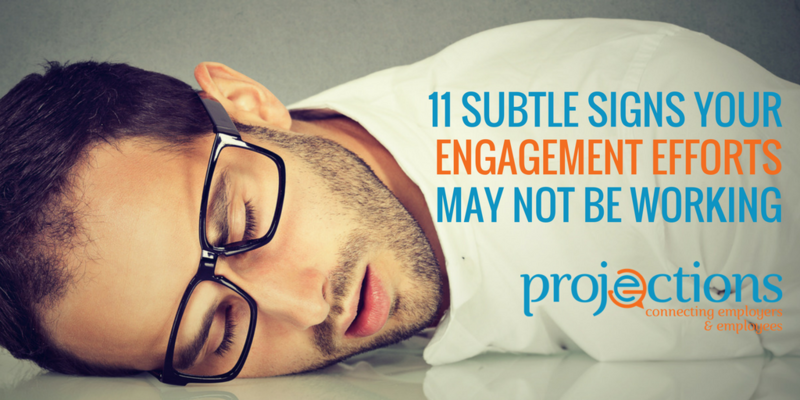 If you’re witnessing any of these signs of failing employee engagement, it’s not too late! In fact, its testament to your commitment to your teams that you’re aware of their needs. Now is the time to begin connecting, and you can use powerfully consistent video messages, highly interactive eLearning and dedicated websites to create an innovative, engaged workforce.